How do we interpret coyote behavior? From precept or from percept and instinct? From an idea? Or from what it looks like and what it feels like? Pat 1 isn’t being hospitable. It’s rude. The message isn’t so clear with the two photos of my Dad coyote of years gone by. Dad 1 is charging. Dad 2 is the stance Dad took after he halted his charge. Note that there is a chain link fence separating us that doesn’t show in the two pictures. What should I have done about Dad charging and then halting, both done as a way for Dad to message his displeasure at my dog and my presence? Should I have acted from a precept like “…it might not be a good idea to give-in to the coyote’s demands by leaving….”, or, should I have acted, well, like what then? I did wonder at the time if by my behavior I was encouraging something that later might not be good for Dad or for another person. At the time I thought, well, at least I was holding my ground. But there’s more to it. When Dad halted his charge he did stand as pictured. After that encounter, and after a couple previous years of similar encounters, Dad’s behavior toward me changed. He was much less confrontational after that day. I can describe from memory how Dad’s behavior toward Holtz and me changed. 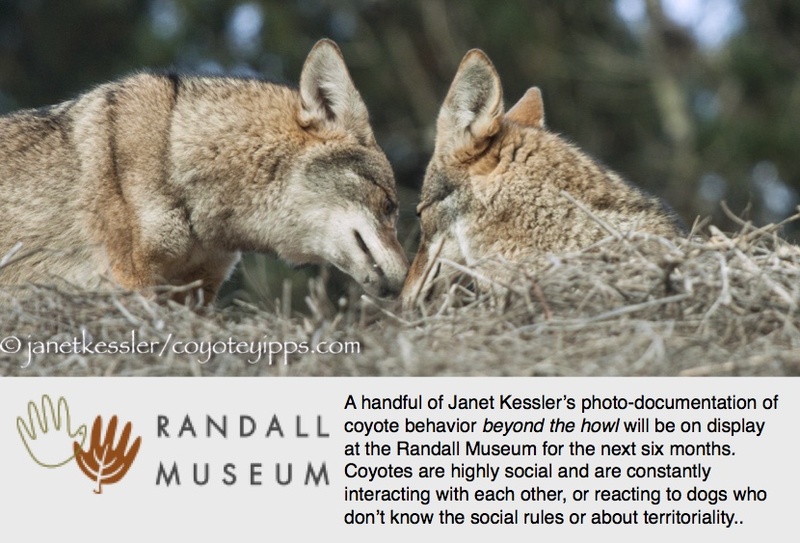 As Janet pointed out, much of coyote messaging behavior is patterned, ritualistic. We know that coyotes are territorial. And we know that at times they are more territorial than at other times. That day Dad was highly territorial and charged my dog Holtz and me because he had pups around. However when the pups were older, my coyotes weren’t to be seen. They were there, but with older youngsters Mom and Dad would not bother with us as much. However, I did notice a change in Dad’s manner toward us when younger pups were around for Dad to protect. Dad would still message us. Yet he would do so without his former vigor. For example, at times when he saw us he would saunter over in our direction, kick up a little dirt, and then wander away. Or at times he would not message us at all. When Mom coyote was around, she would message and Dad would also, but with less vigor. That’s how his behavior changed. The question remains as to why his behavior changed. As to the question of why his behavior changed, at issue is whether or not Dad from reflection, from thought, made a decision to change his behavior toward Holtz and me. I acknowledge that I don’t have an objective basis from which to answer the question: “Did Dad’s behavior change because he thought it over and decided to change his behavior, or did his behavior change for another reason, or for no reason at all?” The answer to that question is presently beyond the reach of science and I want to be clear that the following speculations about Dad’s mind are my subjective assessments of why Dad’s behavior changed. It is a guess for me to say that the Dad 2 picture shows why Dad changed. My guess is that in the moments before, during, and after the Dad 2 picture was taken, Dad formed a judgment about a couple years of his messaging experiences with Holtz and me. The basis for my guess is ‘vibes’ I felt that day as I photographed Dad coyote. So the following is a story I tell myself based on vibes. My account has value to my poetic self as a story, but only has value to my scientific self as evidence of the workings of one aging human male’s own subjectivity. What I felt when Dad was halted and looking at us, looking into the camera, was that Dad was just flummoxed by how Holtz and I behaved. Here he had peed, pooped, scraped dirt, and charged. None of that worked for him. Holtz and I just kept standing there. I kept taking pictures. And you can see from the Dad 1 picture how earnest Dad was and you can imagine how uneasy that charging behavior of his could make me feel. In the Dad 2 picture, I felt sorry for him, he seemed to recognize that whatever he did, it just didn’t do any good. I could sense the gears grinding in his head as he contemplated the situation. I could tell the gears were grinding slowly. I felt bad for putting him in a mental situation where he was shown to be ‘slow’. From Dad’s point of view, we hadn’t moved, reacted, or responded to his messaging behavior. I regard it as fair to say that Dad engages in messaging behavior to effect change. I regard it as fair to say that Dad could tell he wasn’t effecting change by his behavior toward Holtz and me. I regard it as speculative to wonder if Dad recognized Holtz and me as dysfunctional compared to all the other animals in his community. Why dysfunctional, speculatively? Because I, as a human animal, didn’t know how to act like all the other animals Dad had experiences with. I regard it as fair to say that almost any other animal must have given Dad respect in such situations and left the area. Spring is the time in nature where we all gorge. The babies of other species are abundant, easy to catch, chew, and swallow. That’s why we get escorted away by coyotes. They want to prevent their offspring from being eaten. But as to Dad, I had often wondered why he was so slow to realize we weren’t a threat. Well, he was slow because after all, Dad was a coyote. I wondered during those years if he would ever go off script, if he was capable of that. As it turned out, he did go off script. It took a couple years for him to go off the script of his ritual behaviors. Again, if I consider that Dad thought it all over, it’s just my interpretation of why he changed. If someone said Dad, in the moment pictured, tarried from a bout of bad gas, then I couldn’t with evidence refute it. If Dad thought, well, what did he think? My story is that Dad thought Holtz and me were mentally about the slowest animals he had every come across. We just didn’t get it, we didn’t know how to read plain animal-ese. And we seemed incapable of learning simple animal-ese. And so he began to disregard us as hopelessly irrelevant although he could not convince his wife, Mom, of that fact. She would visibly be upset with him when she saw that he had relented. She would get real irritated by him over that. Mom and Dad were married alright, yes they were. Kids coming, kids all around and Dad becoming unreliable? Not in her world. She just took up the slack and had an evil eye for him over that. Again, if I sound like I’m anthropomorphizing, then you are probably looking at my story from precepts of science. The beauty of science is that science will change its ‘mind’ when provided with a supportable basis for a particular change.